A strong heart relies on the health of your whole cardiovascular system--from circulation and blood vessel integrity to healthy levels of cholesterol and blood pressure. Drawing on the heart-healthy traditions of the Mediterranean and Okinawan diets, our ultra premium formula of SuperPure® organic plant extracts is your comprehensive solution for lifelong cardiovascular support and heart health. A strong, healthy heart and cardiovascular system is absolutely vital to our overall state of wellness, no matter our age. Our heart is the most amazing, hard-working and critical muscle we have, beating over 100,000 times per day. It is literally at the very "heart" of our health, well-being, longevity, and happiness. Sadly, cardiovascular disease is rampant and affects over 80 million Americans. When our heart and vessels are unhealthy, we are unhealthy and place ourselves in a highly vulnerable situation. But theres good news too. Each and every one of us has the power to support and maintain our heart and vascular health. Maintaining a healthy body weight, quitting smoking, increasing physical activity, and eating a healthy diet are among the key lifestyle changes that can make a difference. Research has also identified a variety of natural ingredients--fruits, vegetables, enzymes, herbs, spices, and phytonutrients--that can further support and sustain a healthy heart and cardiovascular system. Many of these powerful ingredients are the most helpful and effective components of the Mediterranean and Okinawan traditional diets, two of the heart healthiest populations in the world. 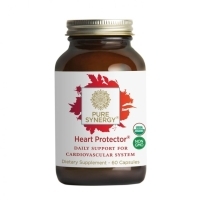 We have combined the best of these highly sought after treasures in a synergy we call Heart Protector. 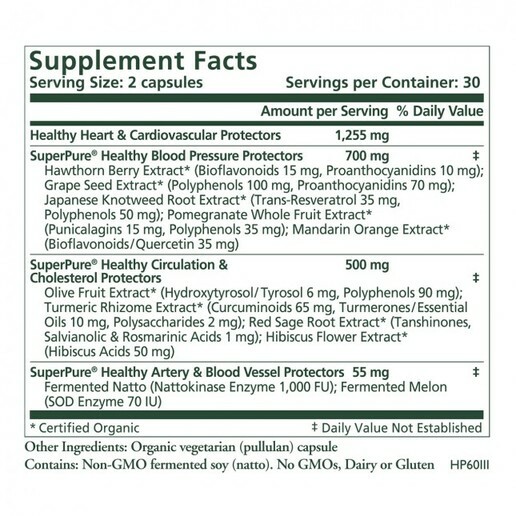 With its diverse array of certified organic, highly concentrated, SuperPure extracts, Heart Protector is deeply supportive for all aspects of your cardiovascular health--blood pressure, cholesterol, circulation, arterial health, heart function, and much more.